Remember how I was threatening to make soup one of these chilly nights? Well after the weather stayed cool and my mother-in-law, Lucy, brought us some corn on the cob from her local farm stand my mission was clear: Corn Chowder. I suppose I could have just boiled it, rolled the ears in butter and sprinkled them with salt and pepper, but where’s the challenge in that? I did a little snooping around online for guidance and found help from both Jamie Oliver and Martha Stewart. I liked how light Jamie was on the cream and the idea of using Corn Stock from Martha’s recipe struck me as a particularly chef-y thing to do without requiring a culinary degree to achieve. I admit that the prep and cooking time mean this isn’t a weeknight meal, but all the more reason to make a big batch on the weekend and reheat a day or so later – it definitely holds up. Chowder can sometimes be overly thick with too much flour or cream to seem appropriate for summer. 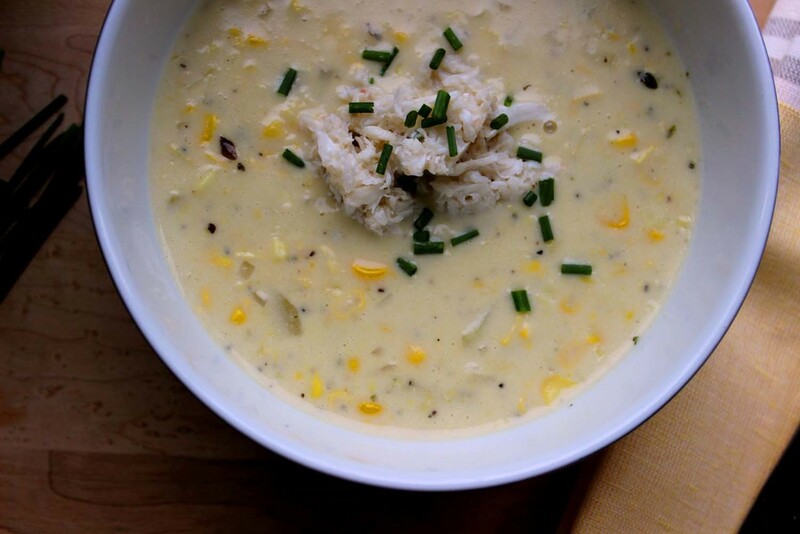 The results of this recipe are the exact opposite without losing that deep flavor and comforting texture that make it chowder and not just soup. I attribute that to two factors: 1. Fresh corn, 2. The corn stock. I know it’s tempting to just grab a bag from the freezer and substitute chicken stock, but having traveled that road before I think this is the better way. Shuck the ears of corn and remove as much silk as possible. Using a chef’s knife, cut a small slice from the stalk end of the ear to make a flat base. Rest the flat end against the cutting board and cut the corn kernels from the cob. Set aside the kernels and place the cobs in a large dutch oven. Peel and quarter one yellow onion and add to the dutch oven. Cover the cobs and onion with 8 cups water and bring to a boil. Once the water is boiling, reduce the heat and simmer, covered for 45 minutes. Then remove the lid and continue to simmer until the stock is reduced to about 2 cups. Remove the corn cobs and onion quarters from the stock and discard. Pour the corn stock into a heat-proof measuring cup and set aside. Place the dutch oven back on the stove top over low heat. Melt together the olive oil and butter. Add the mince shallot and sauté for 1 minute. Next add the peeled, diced white potatoes to the pot and stir to coat with butter and shallots. Cook for 2-3 minutes, then season with 1 1/2 teaspoons kosher salt and 3/4 teaspoon freshly ground black pepper. Add the corn kernels and 2 cups of corn stock to the potatoes and shallots and increase the heat to bring to a low boil. Cook for 5-6 minutes or until the potatoes begin to soften in the middle – check them with a fork or butter knife for tenderness. Reduce the heat to low and stir in the minced, fresh thyme, heavy cream and skim milk. Simmer until the potatoes are fully cooked, but still al dente. Next, use a ladle to measure out 1 cup of the chowder into a blender and puree until smooth. Return the pureed soup to the pot and stir in to thicken the chowder. Serve hot in and top each portion with 1-2 tablespoons chilled, fresh crab meat. Snip the chives with kitchen shears or mince with a chef’s knife and sprinkle a pinch over each bowl of soup. Yes, absolutely. I used a large dutch oven, a large cutting board, a medium bowl (to reserve the corn kernels in), a 2 cup measuring cup, and a blender. For tools I needed one wooden spoon, one chef’s knife, measuring spoons, a ladle and a dinner fork. The Verdict: It probably sounds like I’m tooting my own horn, but I was genuinely delighted by how well this turned out. As proof; when extras languish in the fridge I know it’s only a so-so meal. With the Farm Stand Corn Chowder Mike and I had to negotiate the distribution of the leftovers lest one of us miss out on having a second taste. The crab is a great compliment to the chowder and we liked the contrast of temperatures and textures. Lastly, this recipe is gluten free and also up until that finishing dollop of crab vegetarian too, but still delicious and satisfying. It wasn’t necessarily my goal, but it is good news if you’re cooking for anyone who does have concerns or diet restrictions in that realm. Something everyone can enjoy!